At the K 2013 trade fair, WITTMANN is presenting the W8 pro generation of robots, the advanced version of the W8 robot series which has already proven itself thousands of times over. The professional public in Düsseldorf will have the chance to see the first model series of this new generation, the model W833 pro. More than that, the functional scope of the powerful R8 IPC robot control system has been expanded that is now presented in the version R8.3. The development work for the new generation of robots began with the question of how to further improve what was already essentially a mature and thoroughly proven range of equipment. In order to identify the remaining development potential, a holistic study was undertaken to examine all of the processes – namely procurement, installation, programming, energy input and service – which could be more efficiently designed to the customers’ benefit. The improvement suggestions which resulted from that study were compiled into technical specifications and formed the basis for the recently completed advanced development of the WITTMANN robots.Those technical specifications placed top priority on the modularity of the robot mechanics and of the drive and control system architecture – including the software. Because with such a vast range of applications and axis combinations, it takes a well-conceived modular construction to achieve an optimum price-performance ratio. Consistent application of lightweight construction technology for the axes in combination with the drive concept WITTMANN developed especially for linear robots make the models of the W8 pro series extremely dynamic while maintaining extraordinarily low energy consumption at the same time. The resulting minimal use of moving lines for energy transmission and interconnection further extends the service life of the equipment. Holding brakes with an automatic test function are built into all of the main axes as standard equipment, thereby allowing electrical power consumption to drop almost to zero and further increasing safety while the robot is at rest.The R8 control system with its powerful IPC integrated into the unit and the WITTMANN R8.3 software with enhanced features give users access not only to the proven WITTMANN user interface and innovative functions such as Smart Removal and EcoMode, but also a whole series of useful new tools. They make it easy to formulate process adjustments and permit direct control of peripheral units from the robot control system.The advanced design underscores the outstanding characteristics of the new WITTMANN W8 pro robot series also with the visual impression that the equipment makes.And the signal lamps integrated into the device give the user instantaneous information about the status of the production unit.The W833 pro will be presented at the K 2013 trade fair in combination with the R8 control system, which is now available in the R8.3 version. The current evolution of the R8.3 places particular emphasis on user-friendly operation along with easy communication and interaction with the injection molding unit. It was also designed to be as straightforward as possible for new users to learn to operate. For that reason, the text editor which has proven effective for many years now was retained, but is now assisted by a powerful, graphics-based programming aid. The new QuickNew assistant makes it possible to generate a complete programming sequence in just seven steps. Supported by images and animation, the QuickNew assistant guides the user through the process of programming the system. The creation of a program begins with the selection of the type of ejection (vacuum or gripper), followed by the type of deposition. 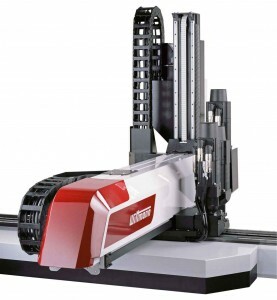 After defining whether quality parts should be stored separately, for example, or gates have to be ejected, the motion sequence in the mold area is specified – and then the basic program is generated. The teaching of the actual positions is then carried out conveniently using the QuickEdit function already familiar from the previous versions. WITTMANN’s objective was to minimize the effort required to create a robot program, in order to realize additional time savings in production. The high-performance R8 control system takes over the setting and checking of authorizations between the robot and the injection molding unit. Relieved of those tasks, now the user can concentrate entirely on teaching the program sequence. 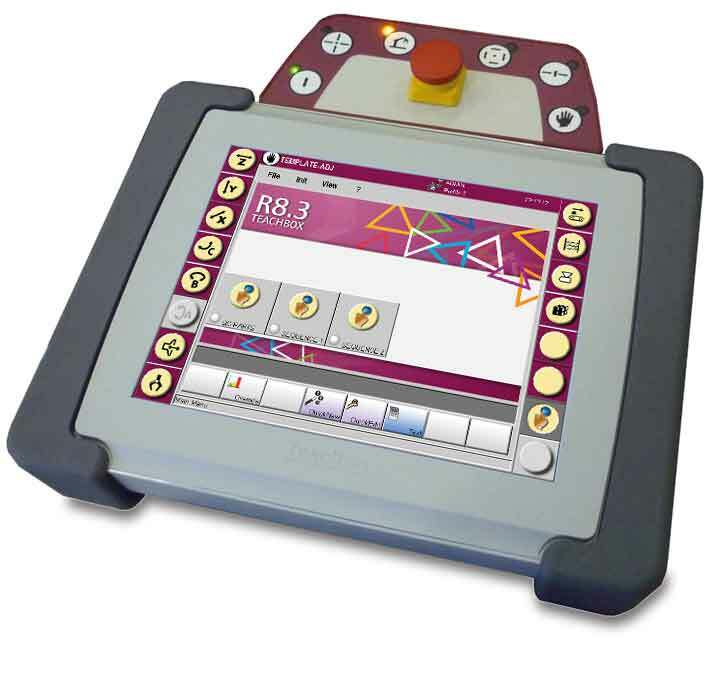 The R8.3 control system has interesting new features in store for experienced users, as well. The mold opening synchronization function has now been integrated into the control system as a standard feature. It enables the robot to “follow” exactly behind the mold. In the case of a fully integrated solution in a WITTMANN BATTENFELD injection molding unit, the position values of the moving plate are passed along directly to the robot via the interface. In applications using processing equipment from other manufacturers, this is done by means of a voltage value. That function enables the robot to react actively to stroke changes of the injection molding unit, thereby minimizing the risk of collisions. The functional scope of the new R8.3 control system is rounded out by the new program loading function. It can be used to select a program directly and as fast as possible via the main display screen and open it with QuickEdit or in the text editor.And of course the other well-established intelligent functions of the R8 control system can also be called up: EcoMode for automatically setting the speed of travel, SmartRemoval to reduce removal time, Automatic Collision Detection to protect mechanical components while teaching and SoftTorque for secure transfer of parts.